So the buzz-kill commentariat has spent all week making sure that we understand that in Mexico, Cinco de Mayo isn’t really that big of a deal. But people, let’s focus on the real meaning of the holiday: a ready-made excuse to INDULGE for every panza verde–lover of the avocado! I decided to celebrate by making a meal out of the Big Three–guacamole, sopa Azteca, and mango-avocado salsa. 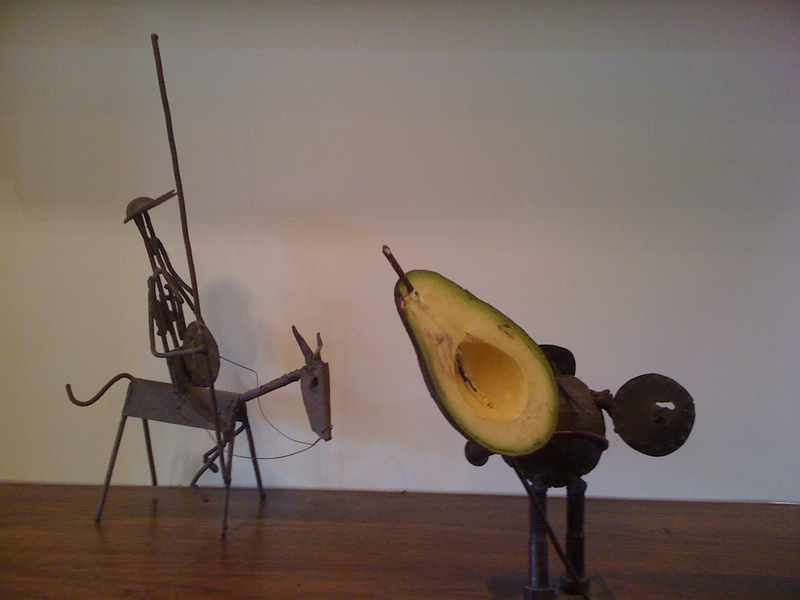 Everybody has a guac recipe! Mine actually focuses more on technique, since the ingredients are pretty much standard. 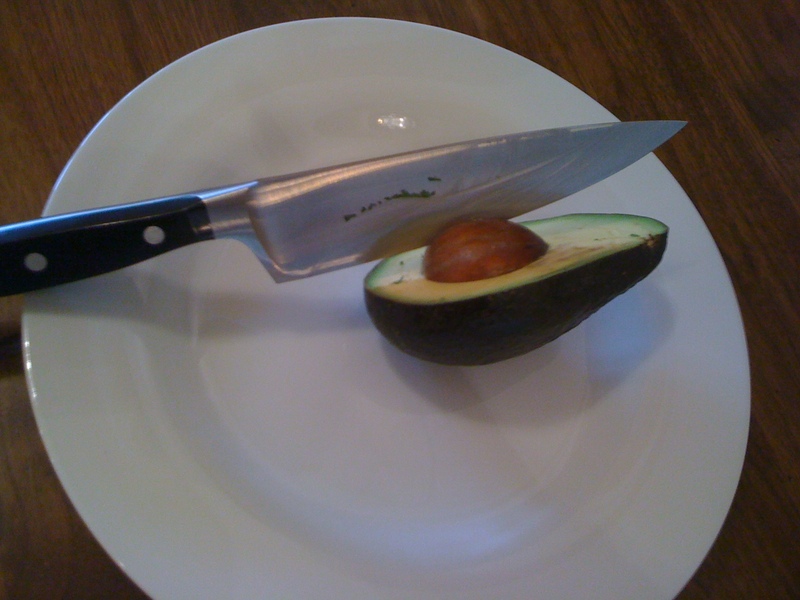 How to get the meat out of the avocado?–After cutting the avocado in half and twisting the halves apart, I thwack my (very sharp) knife into the pit and give it a quarter-turn. Out it comes. Then I dice the fruit still in the skin, and use a spoon to scoop it out. Sprinkle with some lime juice so it doesn’t darken. Done. While that’s going on, I roast the tomatoes, garlic, and peppers (hot!–about 450 for 15 minutes or so, until I’m getting some char). This time I used a serrano pepper; not hot enough. Next time, back to jalapeno (or ratchet up to a habanero?–try a small one). Chop all that up. Dice some onion, chop some cilantro, juice a lime. Add some salt. 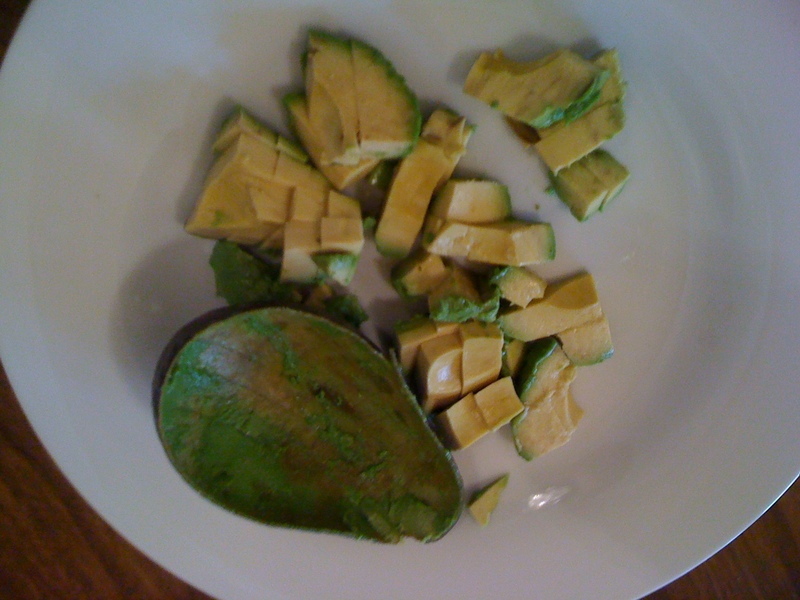 Stir it all together with a fork, mashing the avocado as you go, until you get the texture you want. (I like chunky.) If you roast the tomatoes, you trade off the texture of fresh for the flavor of roasted. I go back and forth; both are good! Then you eat it!–And in the process, maybe you use up the whole first batch of fried corn tortilla chips that you made for the sopa Azteca. 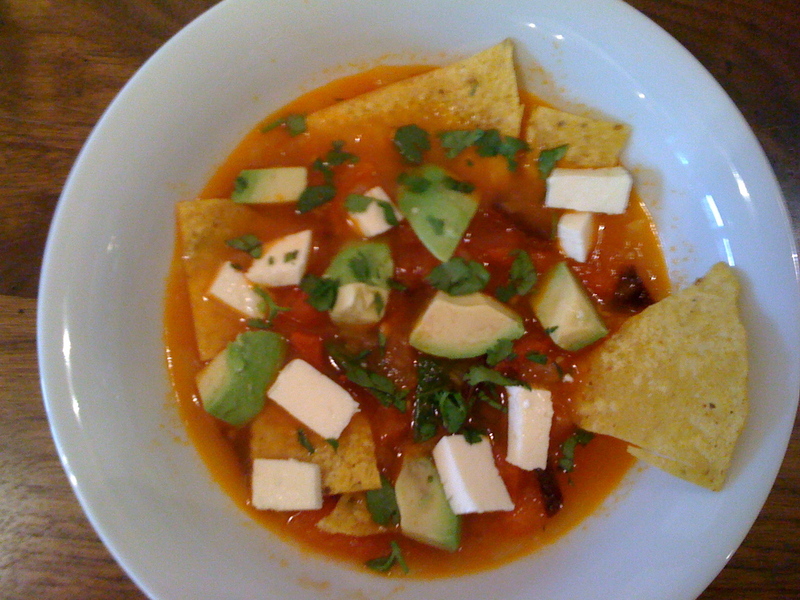 Do not let people tell you this is tortilla soup!–So much tastier! I found my recipe in Oaxaca back in 2006; it’s in Spanish, so some interpretive maneuvers come into play. To start, “muela y fria el tomate”–”grind and fry”? Okay, make that “chop and fry.” So, take a couple of pounds of ripe tomatoes, chop them up, and fry them in hot oil with a chopped onion and a couple of garlic cloves (“dientes” or “teeth” in Spanish). You end up with a very fragrant thick tomato slurry. Add a handful of epazote leaves (nature’s beano), some salt, and a little water (“un poco”–I add about a quart and a half. Decide by the thickness you want). Some recipes go for chicken stock instead. While that’s simmering, remove the seeds, veins, and stems from about three dried chiles guajillos (find them in the ethnic aisle). Toast them in a dry pan until they are fragrant and your throat is catching a little from the vapors. Cool them and cut them into little strips or squares. Add them to the soup and continue simmering for say 15 minutes minimum. 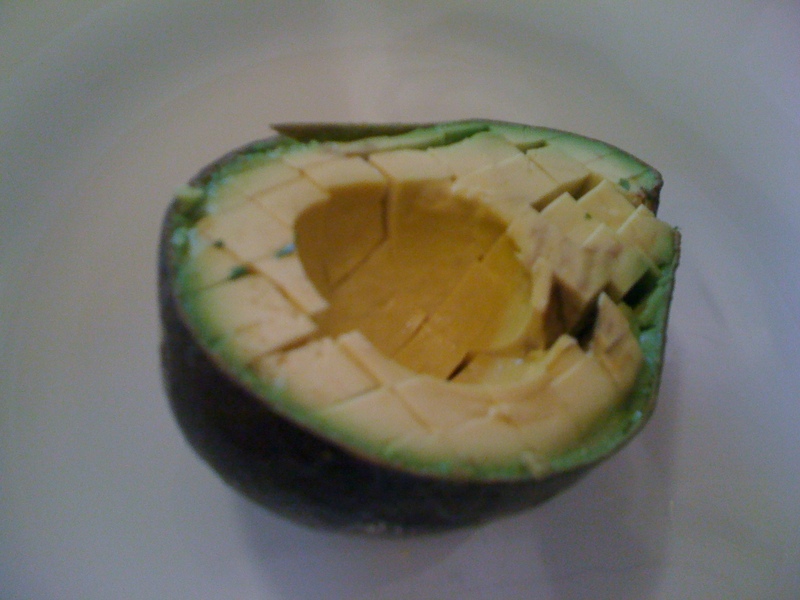 Then dice some avocado and some queso fresco (use mozzarella if you can’t find it). Put the tortilla bits, avocado, and cheese, as well as some chopped cilantro and lime wedges, each in its own dish on the table. Ladle the soup into shallow bowls and let everybody garnish it the way they like. For me, it’s always all the way! 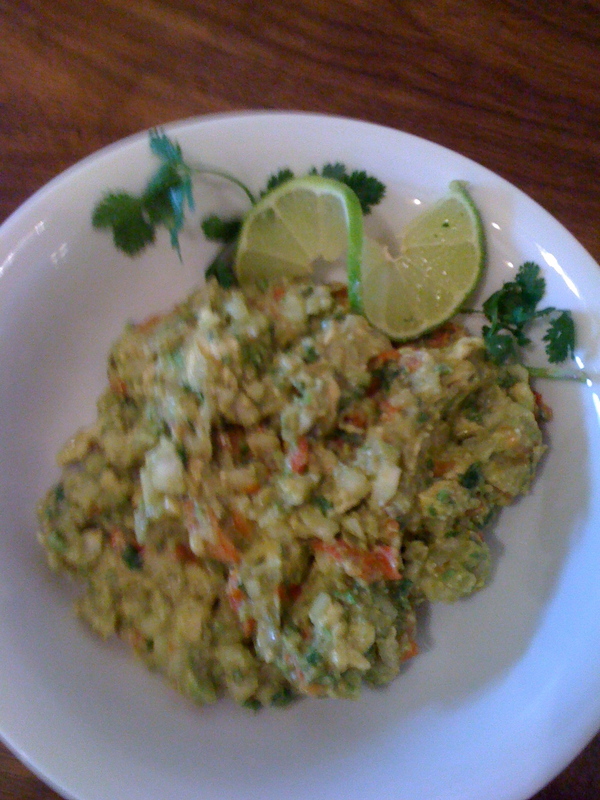 I don’t remember where I got my recipe for mango-avocado salsa, but it’s probably a lot like yours. 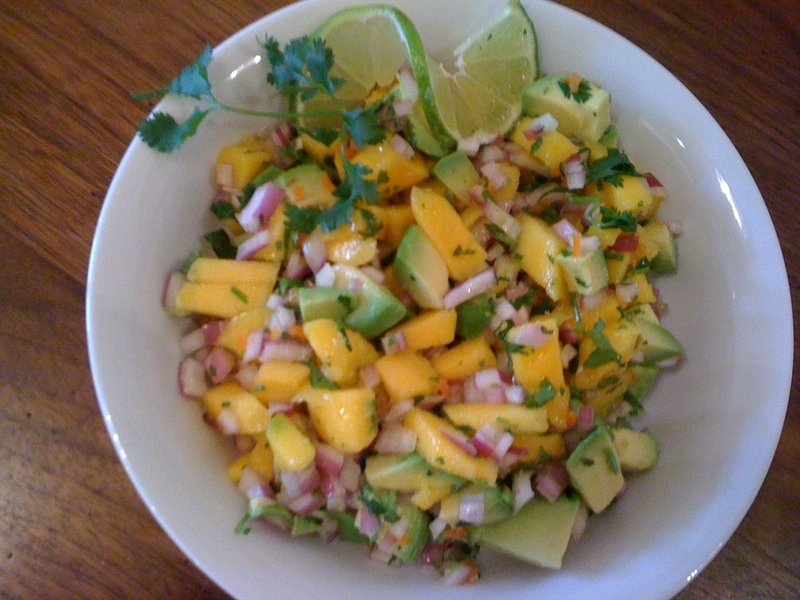 Diced avocado, diced mango, diced red onion. Add chopped cilantro and lime juice. A little salt. All this talk about habaneros!–I seeded one and minced the flesh. Never going back! A salsa goes on something; in this case, a little halibut steak. Salt, pepper, a dusting of flour. Fry it until it is almost completely opaque, then let it sit there on the plate for a minute or so–it’ll finish cooking through. After the sopa Azteca, I was way too far into hot oil! My steak picked up more of a crunchy skin than I really wanted. Note to self: take it easy (and maybe skip the dusting of flour). But very moist and tasty nonetheless! Bueno apetito! 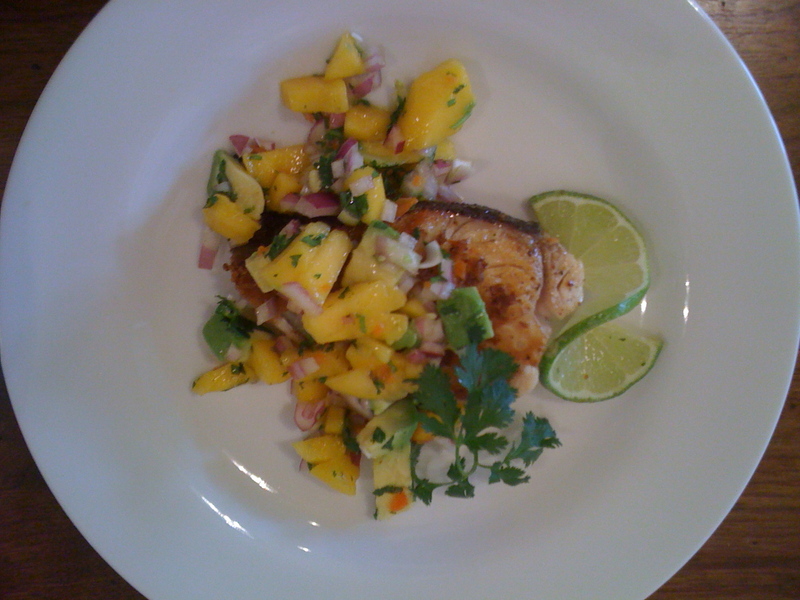 This entry was posted in Recipes and tagged Cinco de Mayo food, cooking fish, cooking Mexican food, guacamole, home cooking, Mango-avocado salsa, Sopa Azteca by judyramey. Bookmark the permalink.